FORMULA ONE: Max Verstappen has scored an unlikely victory at his Red Bull Racing team’s home race after a tense race of extreme attrition cost Mercedes its first double retirement since 2016. The Austrian Grand Prix was expected to be a pedestrian affair, but a combination of mechanical failures and the effects of the highest track temperatures of the weekend on the tyres conspired to deliver an unpredictable race. The afternoon began unravelling on lap 15 when pole-sitter Valtteri Bottas retired with a gearbox problem. His stopped Mercedes triggered a virtual safety car, and most of the field chose to make an early stop for new tyres. Race leader Lewis Hamilton was told to stay out, but it was in error: the pursuing Red Bull Racing and Ferrari cars were quicker on their fresh tyres and the heat was taking its toll on Hamilton’s rubber. Mercedes strategist James Vowles admitted to the Briton that he’d lost him the win when he was called into the pits for fresh tyres on lap 25, dropping him to fifth behind new leader Max Verstappen, Daniel Ricciardo and Kimi Raikkonen, but even on new rubber he was struggling to make an impact. Up ahead, however, Ricciardo was struggling with blistering tyres in the Austrian sun. He was passed by Raikkonen on lap 38, triggering the Australian’s second tyre stop. Despite his newer tyres Hamilton too began struggling with blistering, and after a frustrated burst of radio messages he was called into the pits for a second tyre change on lap 52, dropping him down to fifth behind Ricciardo, both now out of victory contention. Both their days went from bad to worse in a matter of laps, however, with Ricciardo retiring with a broken gearbox on lap 53 and Hamilton’s power unit forcing him to stop 10 tours later. Verstappen led Ferrari teammates Raikkonen and Sebastian Vettel, who had inherited third place through the retirement, and both unleashed on the Dutchman, who was now nursing some emerging blisters of his own. The gap closed from a high of seven seconds to less than two seconds as the trio started the final lap, but Verstappen held firm under Raikkonen’s pressure to record his first win of the season and Red Bull Racing’s first victory at its home race. “It was amazing,” exclaimed Verstappen. “It was very hard to manage the tyres, we really had to look after them, and we managed to hang on until the end. 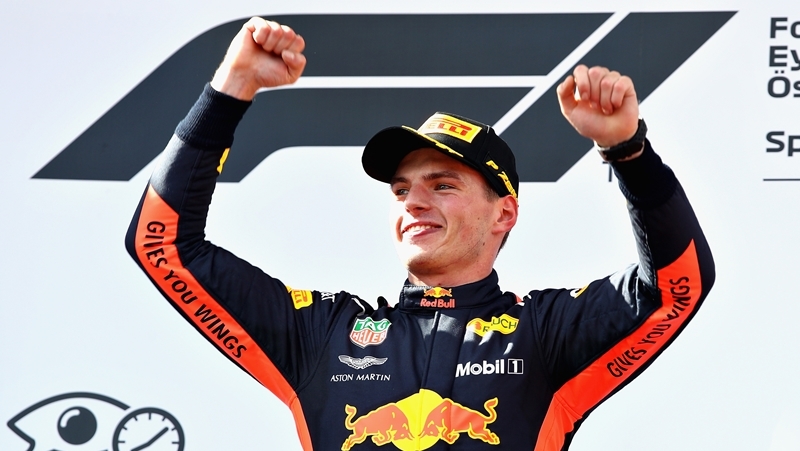 It was an important victory for Verstappen, who had been heavily criticised in the opening six races of the year for a string of messy crashes that cost him points and a potential victory in China. Raikkonen took second place after a week of febrile speculation that he is destined to be replaced by Charles Leclerc, perhaps as early as August. The Finn started from third on the grid and made an assault for first with a gutsy dive between the two front-row-starting Mercedes cars on lap one, but he fell to fourth behind Verstappen after running wide at turn three. He was passed by Ricciardo for the place on lap nine, but a solid stint on the soft-compound tyre after his pit stop ensured he could capitalise on the misfortune around him and guarantee his fifth podium of the season. “The car came very good, but we just ran out of laps,” said Raikkonen, reflecting on his victory chase. “It’s a shame, we had a great car today. Sebastian Vettel finished third to reverse Hamilton’s 14-point drivers championship lead and seize a razor-thin one-point advantage. The German started sixth after copping a three-place grid penalty for impeding another driver during qualifying and dropped to eighth on the first lap, but passes on Haas drivers Romain Grosjean and Kevin Magnussen before and after the pits tops respectively put him back on the tail of the frontrunners, which turned into third place when his rivals retired. “Obviously it would’ve been nice to start further up,” he said. “I think the pace was very good, tyre management was very good. Grosjean and Magnussen delivered big points for Haas after eight races of underdelivery by the team that started the season with the fourth-fastest car. The result was particularly important for Grosjean, who had hitherto failed to score a point through a series of critical driver errors. Force India’s Esteban Ocon and Sergio Perez finished sixth and seventh, separated by less than two seconds, and McLaren’s Fernando Alonso picked up four points in eighth. Sauber recorded is first double-points-finish since 2015 thanks to Charles Leclerc and Marcus Ericsson’s ninth and 10th places. Formula One’s unprecedented triple-header concludes next weekend (July 6-8) with the British Grand Prix at Silverstone.